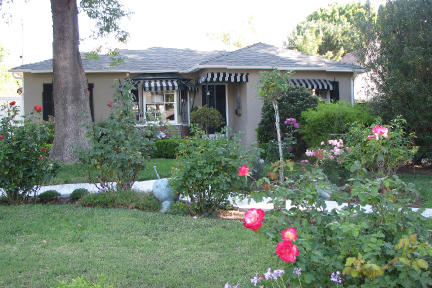 Every spring the City of Santa Ana honors devoted homeowners who improve and maintain their front yard hardscape, landscapes and overall appearance of their homes. 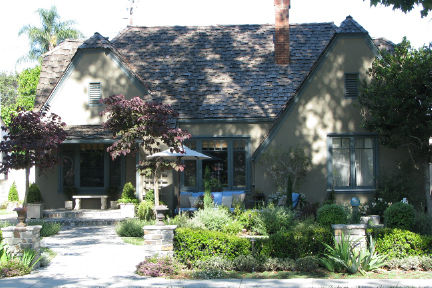 Three nominees from each neighborhood are submitted for the Most Beautiful Yard Contest by the neighborhood association to be judged in-person by the Community Development Agency. Read more after the jump. 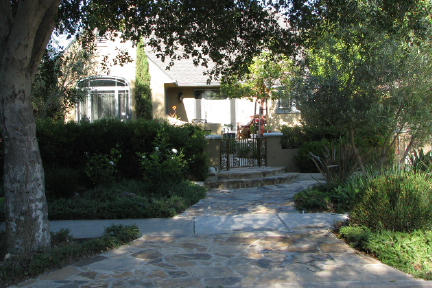 The winners are…Steve and Nadine Wareham on Valenica Street for their newly installed, English garden inspired front yard. It has a wide, gently curving walk, courtyard, steps and front porch deck, all made of multi-colored San Juan Cobblestone. The perimeter of the yard is defined by stone pilasters which are set back three feet from the city sidewalk to allow ample space for a multitude of textural, colorful ground covers. Low African boxwood hedges pruned in gently swooping shapes serve a low “fence” between the pilasters rather than solid masonry or pickets. Beyond the pilasters are two zones, a lawn surround by planting beds and a low stone seat wall that creates privacy for the patio adjacent to the home. Two Forest Pansy Red gum trees planted at slight inward angles flank the cobblestone walkway forming an arching “cathedral” affect to frame the steeply pitched roof gables of their Tudor home. Steve and Nadine designed and installed the yard themselves and wish to thank their gracious neighbors for their patience during the prolonged construction and installation process. For their efforts the winners receive from the city a $50.00 prize, recognition at an award ceremony on June 23rd, and a well-earned “bragging rights” sign for their lawn until the 2012 winner is selected. Thank you to all our nominees, and many other gardener neighbors for making Park Santiago a more beautiful place to live!